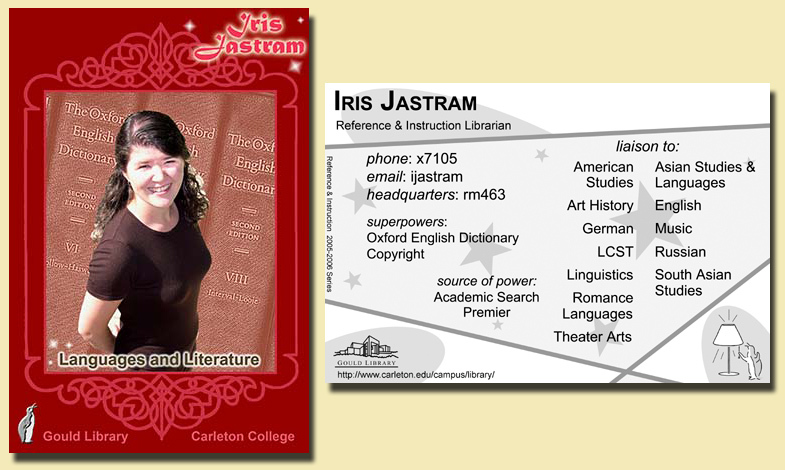 We also discovered the William College Liaison Librarians must have liked our 05-06 trading cards. Wow. And now… Why I Have a Headache. I relearned how evil Elsevier is, though I’m not sure I’m at liberty to discuss their new act of extortion and peevish tantrum-throwing just yet. I also spent almost all of three days trying to help one class of students answer impossible questions only to be told by a professor (not the professor class I was helping, btw) that I was doing their homework for them. Oh, and he copied the professor I WAS working for. He’s not even a professor in my liaison departments. Coming at a particularly vulnerable and tired time for me, this criticism completely shook me. I kind of expect to be told that I could do more, and I generally welcome constructive criticism, but the only two times I’ve been completely and utterly shaken by criticism at work were times when I’d worked extra hard only to be (figuratively) patted on the head and told “that’s nice, dear, but we didn’t want you to work that hard and we don’t really think the effort was worth it.” I guess it comes with the territory. Basically, I’ve had one of those weeks a librarian dreads: all impossible questions with no sense of accomplishment. I even made people mad over the fact that we have electronic access to the Chronicle of Higher Education but aren’t allowed to give out the password or copy and paste articles. No, it’s all freely available, but you have to come “all the way” to the library and have one of us log you in. Yes, I realize that you might as well just read the paper copy we have at the library, but that’s life (and our license agreement). Oh, and I’m facing a 6-day week since this is my Sunday to work and there’s no time for a comp-day next week. Bwah-ha-ha-ha. But, I resolve to get to some of my backlog of blog stubs. if you have lexis-nexis academic, you CAN get patrons into it, but it’s ugly at best. sigh. i hear you on the week – i’ve had more than a few of those in my day too. at least you didn’t have a faculty member yell at you. yes, that’s happened to me. bleh. The yelling incident? I waited until after he left before I burst into tears. FWIW, after avoiding me for about a year, he *totally* made nice with me and was one of my biggest fans. I have my theories on the whole scene, none of which are particularly flattering to him, patriarchy, or academia. But I did end up with an unexpected ally, so that’s good.